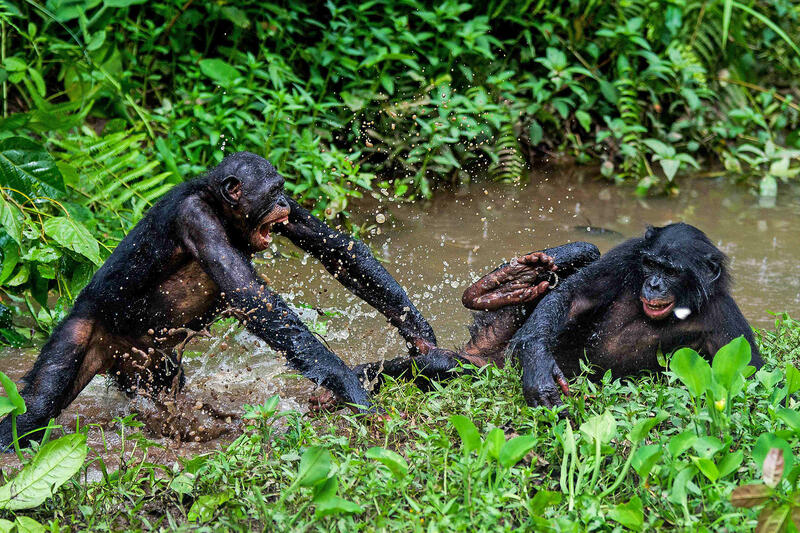 Two bonobos play fight at the Lola Ya Bonobo sanctuary in Democratic Republic of Congo in 2012. "In the animal kingdom, there are all kinds of acts of cooperation. But we don't see things like building skyscrapers or the establishment of institutions," says comparative psychologist Christopher Krupenye, who did the studies while at Duke University. "Humans are much more cooperative, and we do elaborate kinds of cooperation in ways that we don't see in our closest relatives." This bias toward helpfulness seems almost hardwired in humans. Back in 2007, for example, researchers reported that 6- and 10-month-old infants could evaluate social interactions that they saw in puppet shows. These babies couldn't even talk, but they showed a definite preference for interacting with characters that had been helpful to others. What's more, they would avoid those who had meanly thwarted another's efforts to reach a goal. Krupenye and his colleague Brian Hare decided to basically repeat those experiments with bonobos at Lola Ya Bonobo, a sanctuary for orphaned bonobos in the Democratic Republic of the Congo. One test involved three strangers putting on a little skit in front of the apes. One actor played with a stuffed animal, laughing and throwing it in the air. The toy then fell out of reach, and a "helpful" actor picked it up and tried to return it to its owner. But before that could happen, however, a "mean" actor snatched it away and placed it in a bucket behind him. Then everyone stood up and approached the bonobo, who had been watching through the bars of a cage. The "helper" and "meanie" both offered a piece of food. "The bonobos weren't very interested in the helper," says Krupenye. Instead, they consistently chose to take food from the jerk. The researchers did this experiment in bonobos because these apes are known for being particularly friendly and social. Now they want to know how chimps react in these experiments, because bonobos, chimps and humans share a common ancestor that existed about 6 million years ago. "In order to get at the full evolutionary picture, chimpanzees are a really important next step," says Krupenye. "In some ways, it's really surprising that bonobos don't show the human-like pattern — finding this result in human infants one might assume that a preference for nice individuals might be a universal pattern for all social species," says Laurie Santos, a comparative psychologist at Yale University who studies the origins of human cognition. "This new bonobo study suggests that looking to a species' ecology can help us to better interpret their social preferences, and that humans may be unique in more of these preferences than we suspect." Kiley Hamlin, a researcher in developmental psychology at the University of British Columbia who did the original studies in human infants, points out that hierarchies are ubiquitous in both human and primate societies, so the bonobos' sensitivity to dominance is not surprising. "Even human infants are sensitive to dominance relationships," she writes in an article being published alongside this new research. But she says evidence suggests that toddlers prefer those whom others appear to respect, while they dislike bullies who dominate through force. "Interestingly, bonobos do not appear to share this aversion," Hamlin writes, noting that many questions remain about what mechanisms support pro-social behavior in both humans and other species. In the animal kingdom, humans stand out for their willingness to help each other, to help even total strangers. Scientists have been trying to understand how this unique trait evolved. And as NPR's Nell Greenfieldboyce reports, now they've found a fascinating difference between apes and humans - human babies, to be precise. NELL GREENFIELDBOYCE, BYLINE: Human babies before they can even talk can watch social interactions and decide who's being helpful and who is mean. Christopher Krupenye says scientists have known this for about a decade after some lab studies had 6- and 10-month-old babies watch simple puppet shows. For example, one puppet - a little circle with eyes - would try and try and try to scale a hill. CHRISTOPHER KRUPENYE: And he's either helped by the helper who pushes him up the hill or hindered by the hinderer who pushes it down the hill. KRUPENYE: They're reliably reaching towards the helper. GREENFIELDBOYCE: Human babies seem to be instinctively drawn towards helpers. Krupenye and a colleague at Duke University, Brian Hare, wondered if the same preference exists in an ape that has a reputation for being particularly social and friendly, the bonobo. KRUPENYE: Bonobos are one of our two closest relatives along with chimps. GREENFIELDBOYCE: The researchers designed a series of experiments for bonobos that were very similar to the experiments done with human infants. But the bonobos did not respond like the babies did. They did not reach out towards helpers. KRUPENYE: Perhaps strikingly, we found exactly the opposite. The bonobos weren't very interested in the helper. Instead they consistently chose the one that was blocking or thwarting the other individual's goal. GREENFIELDBOYCE: The results are reported in the journal Current Biology. Why bonobos would prefer jerks might not be obvious to most humans. But Krupenye says bonobos seem to interpret non-unhelpful behavior as a sign of dominance, and dominant bonobos control food and mating opportunities. KRUPENYE: They're attracted to an individual who might be a powerful friend or ally as opposed to someone who's just generally helpful or pleasant. GREENFIELDBOYCE: He says a next step will be to look at this in chimps. If chimps behave in the same way as bonobos, that would be strong evidence that humans hardwired love of helpers is unique and evolved within the last 6 million years. Nell Greenfieldboyce, NPR News. Transcript provided by NPR, Copyright NPR.